We have just learned that 7 ex-members of the Aum sect who participated in the sarin gas attack in Tokyo in March 1995, sentenced to death had just been executed this morning, July 6, 2018. This allows us to come back to this dramatic attack and to assess Sarin gas and its use. The sect Aum Shinrikyō whose name means Supreme Truth of Aum was created in 1984 by Shōkō Asahara and it was in 1987 that this simple yoga workshop obtained the status of a religious organization with the official support of the 14th Dalai Lama, who regretted being fooled. Ideology is a strange mixture of Buddhism, Hinduism, Christian apocalypticism and New Age! The movement is well-determined to provoke an “Armageddon”, that is, the ultimate battle between the forces of good and evil during the final judgment (Revelation 16:16), during which only the followers of the sect would survive this fight. To “encourage” donations and punish those who oppose the cult, assassinations and kidnappings are regularly carried out. In order to justify these crimes, the guru develops the concept of “poa”, that is, that murder is legitimate if it prevents the victim from committing an act that would attract a bad Karma. In a nutshell, cult members could kill anyone! During the Yoga sessions, the faithful reached the “divine experience” with the help of amphetamines and LSD! The group had up to 10,000 members in Japan and 35,000 in Russia. In April 1990, 3 vehicles spread botulinum toxin in the streets near the Japanese Parliament in Tokyo, the US naval base at Yokosuka and Narita International Airport. The too weakly virulent strain of Clostridium botulinum used to isolate the toxin, insufficient quantity and poor spreading systems were responsible for the failure of the attack. In 1992, the guru himself tried to obtain the Ebola virus during a “humanitarian” mission to Zaire. In 1993, another attempt to spread botulinum toxin was made against foreign dignitaries who came to Japan for Prince Naruhito’s wedding. In the same year, a strain of Bacillus anthracis was spread from the top of a building tower and several vehicles: the vaccine strain used was obviously too low pathogenic to be effective! All these events were only known in 1995. In 1994, a laboratory dedicated to the manufacture of chemical warfare products was installed by the sect. Several personalities have been the target of products such as sarin, phosgene and VX. The first large-scale sarin gas attack took place in 1994 in the town of Matsumoto which had opposed the sect and killed 8 people and injured 200. On February 28, 1995, the brother of a runaway follower was kidnapped and killed. The perpetrators are identified as belonging to the Aum sect and on March 18 the sect was warned of imminent police action which precipitated the advent of Armageddon and the sarin gas attack in the Tokyo subway which killed 11 people and injured more than 5,500 that we have already reported in this blog. In 1995, 50 tons of sarin were found in an abandoned chapel. Some 190 members of the sect have been sentenced to various sentences. The first death sentence was pronounced in September 1999. 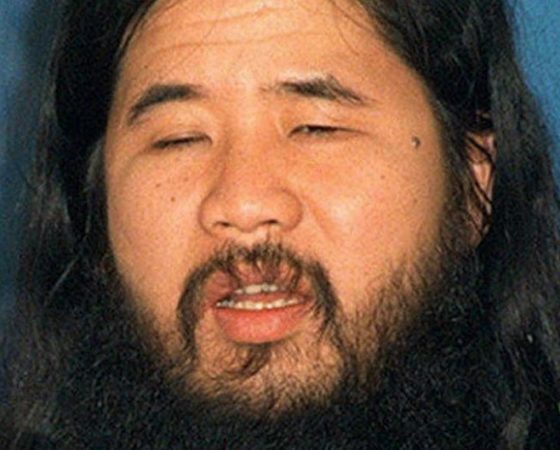 The one at Shōkō Asahara (her real name Chizuo Matsumoto) was confirmed in 2006. The guru was executed by hanging this Friday July 6, 2018 with 6 other convicts. Six more are still waiting on death row as we speak. Sarin was developed in 1939 in the laboratories of IF Farben (Ruhr Valley). The inventors Gerhard Schrader, Ambros, Rüdiger and Van der Linde gave it its name. Sarin gas belongs to the family of organophosphates which includes the agents G (for Germany) = GA Tabun, GB Sarin, GD Soman and the agents V (for Venomous), VX and VR. They’re neurotoxic molecules. At room temperature, it is colorless, odorless and liquid. It quickly evaporates as a colorless and odorless cloud. It is considered a very lethal and not very persistent agent. It is soluble in water and most biological fluids. In the event of contact with sarin, symptoms include excessive saliva secretion (hypersialorrhea), breathing difficulties (dyspnea), contracted pupils (myosis), nausea, vomiting, incontinence, loss of consciousness and coma. Death occurs by asphyxiation after a period of convulsion. The differential characters recognized by the toxidrome is characterized by muscle contractions, great weakness, or paralysis and increased secretions. All neurotoxic agents act by inhibiting acetylcholinesterase causing acetylcholine accumulation in the synapses. The cholinergic crisis that follows causes hyperstimulation of the organs giving the symptoms described above. Conventional treatment consists of injecting atropine that blocks acetylcholine receptors, or acetylcholine antagonists and pralidoxime that reactivates acetylcholinesterase. Benzodiazepine-based anticonvulsants are also used. From 1950 the Soviet Union and the United States produced significant quantities. On 16 March 1988, the Iraqi army massacred 5000 civilians in Halabja (Iraqi Kurdistan). The chemical weapons were cyanide, mustard and nerve gases including sarin. 1983-1988. Iraq used combat gases on several occasions, including sarin against Iran during the Iraq-Iran war. In 1991, during the Iraqi insurrection following the debacle of the Iraqi army after the Gulf War, Iraqi helicopters massively bombarded the Najaf and Kerbala regions with 10 to 32 sarin bombs. In 1994 and 1995 the Aum sect spread gas to Matsumoto and the Tokyo subway (see above). In 2004, an explosive device loaded with sarin exploded during an attack during the Iraq war. In 2013, samples analyzed by the DGA’s Bouchet study center showed that sarin gas killed people in the Jobar region of Syria. The Syrian army is responsible for an attack in Sarin during a bombardment on the eastern suburbs of Damascus on 21 August 2013. It would have killed between 100 and 1,300 people. In April 2017, more than 80 people died as a result of a sarin attack in Khan Sheikhoun, Syria, during the Syrian civil war. The responsibility seems to lie with Bashar al-Assad’s regime, which fiercely denies the facts. On 7 April 2018, the Syrian regime is again accused of having targeted civilians in an attack in Sarin on 7 April in Duma (Ghouta) which provoked a real massacre. The simultaneous use of chlorine was intended to mask the presence of Sarin. A response by the United States and France by sending several missiles to destroy the Syrian military airport of Tiyas located between Homs and Palmyra. The Chemical Weapons Convention was opened for signature in Paris in 1993. Burma and Israel have signed but not ratified. Countries have committed to destroying their entire arsenal and the OPCW, the Organization for the Prohibition of Chemical Weapons, is responsible for the inspection and destruction of chemical weapons. Despite this agreement, it is difficult to imagine that any chemical threat has been eliminated. This entry was posted in blog-en and tagged biological agent, Chemical agent, History, News. Bookmark the permalink.